In almost three years of blogging, I have shared one recipe for a drink. One. Check the index, and you will see caipirinha, the Brazilian national drink, sitting all alone in that category. This disturbing situation changes today, with a nice drink Phil made for us this past weekend, inspired by a recent show from Giada de Laurentiis: the peartini. We modified the recipe making it a lot less sweet, and a tad less alcoholic. Make the simple syrup by heating the water and the sugar in a small sauce pan, until completely dissolved. Allow it to cool to room temperature, and store in the fridge for future uses. Place ice cubes in your shaker until half full. 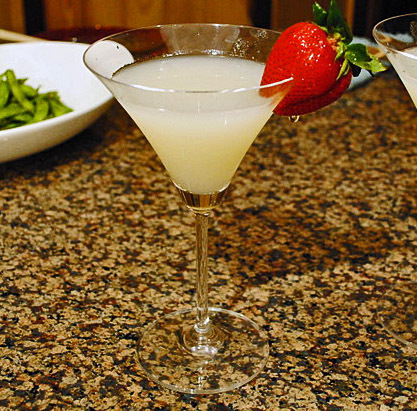 Add all other ingredients for the drink, shake well and pour on martini glasses. Garnish with a strawberry sliced halfway, not all the way through (obviously). Sip slowly, it will match perfectly your favorite type of sushi and sashimi. When juicing the pears, be careful because they oxidize very quickly. Mix the juice with some lime juice to slow down the process, or the drink will have a bit of a brownish hint. No harm in flavor, only in looks. 1. We passed all pears through our Juiceman Jr., and forgot to put aside a couple of slices for garnish. TWO YEARS AGO: Paris, je t’aime!